Time travel isn't really possible, yet we're often drawn to experiences that evoke our past, even though they don't actually re-create them. They play on our nostalgia--a rosy view of what we remember of old that holds on to the good and jettisons the rest. Television shows like Mad Men play into this, presenting a stylized vision of the past. Setting aside the show's fascinating yet often deeply flawed characters, was life in the '60s really as stylish as it's portrayed on Mad Men? Probably not, yet it's a fun world to visit. Similarly, The Riggsby plays on our nostalgia for foods from the past, specifically that era of American cooking from the late '60s or so until the early '80s when proteins were the unabashed champions of the entree section and French cooking was considered the "creme de la creme" of good food. Sure, this era was also dominated by the rise of food processing, frozen entrees, MSG and high-fructose corn syrup, but, working from nostalgia, The Riggsby gets to ignore those things and instead deliver a menu that plays on our memory of what delighted us from that time. And it's a menu that's quite varied too, which helps usher the food into the modern era of today where French cuisine isn't so dominant and Americans' ideas of what makes good food has greatly diversified. 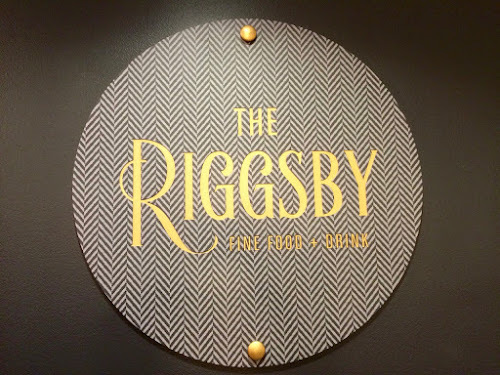 Additionally, as a hotel restaurant, The Riggsby needs to appeal to a diverse clientele, so its approach that draws on a number of influences--French, German, Italian and American--satisfies both its interest in eclectic nostalgia and the varied appetites of its guests. 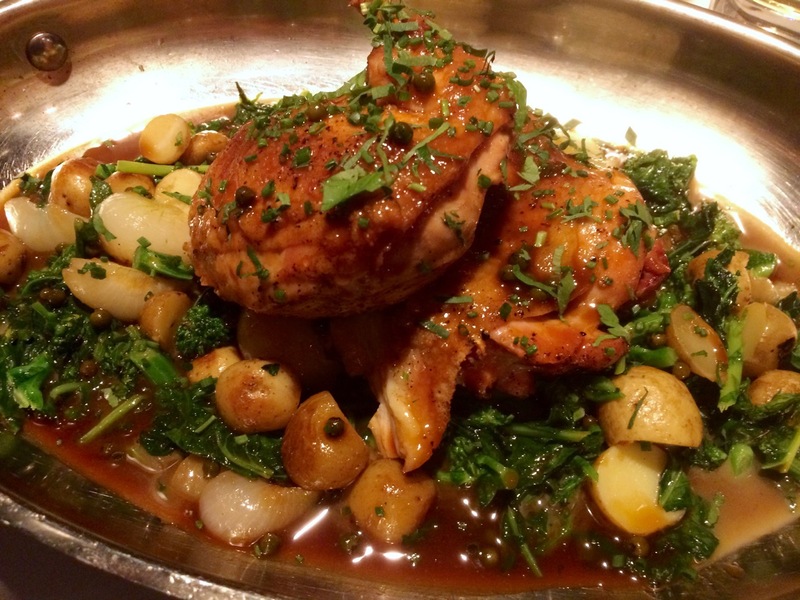 The Riggsby is probably the first D.C. restaurant to come along in a long time that could call its cuisine "continental"--a once common term for fine dining restaurants serving food influenced by a range of European traditions. 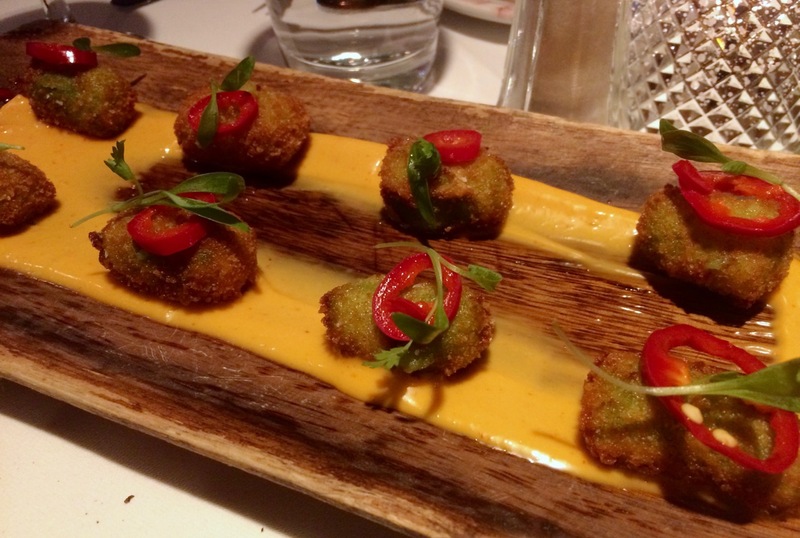 That "little bit of everything" approach should ensure you'll find something on the menu that interests you. There's a burger with bacon-onion jam that sounds amazing, there's a steak--a good box for any hotel restaurant to tick, there's a spaghetti dish--a riff on pasta all'amatriciana. Something that is missing, however, is a vegetarian entree. Non-meat-eaters take note. A short list of snacks is a good way to start the evening. We're tempted by the homemade potato chips with onion dip and the deviled eggs with chilies and crispy chicken skin, but settle on the jalapeño tater tots, a dish that exemplifies the menu's updated nostalgia perfectly. These aren't the oven-baked tater tots of yore, but rather creamy potato puree with a crispy exterior arranged on top a spicy aioli and garnished with thin slices of red jalapeño giving the bites a gentle kick. 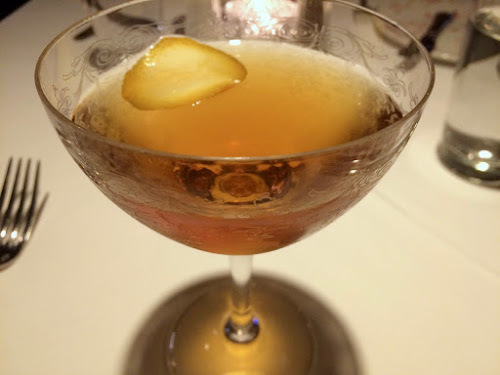 A cocktail is also a must, and The Riggsby's drink menu is divided between classic and original drinks. We opted for the latter, and I loved my Social Smoker made with mezcal, Caradamaro (a cardamom liqueur), maraschino and orange bitters. Chris's Last Frontier, a sort of bourbon-amaretto sour was also good. I'd read about the Jimmy Special "Chopped" House Salad and really wanted to try it. I loved how every bite delivered something a little different: green beans, a cube of cheddar or slices of radish. The mix of ingredients arrive showered with crumbles of bacon, hard-cooked egg and frico (parmesan cracker) dressed judiciously with Thousand Island dressing. 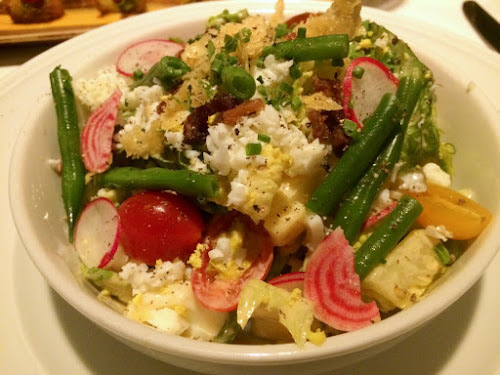 Chris's endive salad was also interesting, although not as good as the chopped salad. I liked its use of nuts and the ghostly-white pickled strawberries were interesting, but overall I thought the salad was too bitter. That was actually a theme of the night: everything I ordered was better than what he ordered, revealing that while there's a lot that's really good on this menu, not everything is a stunner. We felt similarly about our entrees. I was very pleased with my roasted chicken, which consisted of two generously portioned pieces of chicken perfectly roasted and served with small potatoes, onions and broccoli rabe held together by a rich brown sauce flecked with green peppercorns. 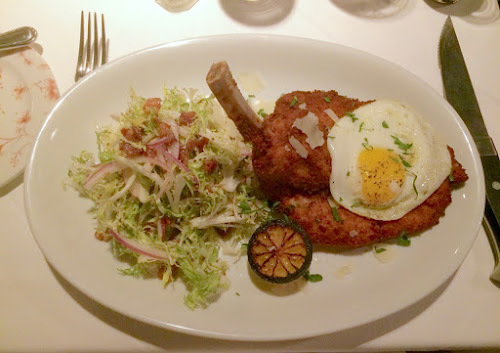 Chris went for the more adventurous Schnitzel "a la Lyonnaise," which arrived with a fried egg and frisee-shallot side salad--i.e. a Salade Lyonnaise. I liked the crispy breaded schnitzel, but Chris found it to be too dry. 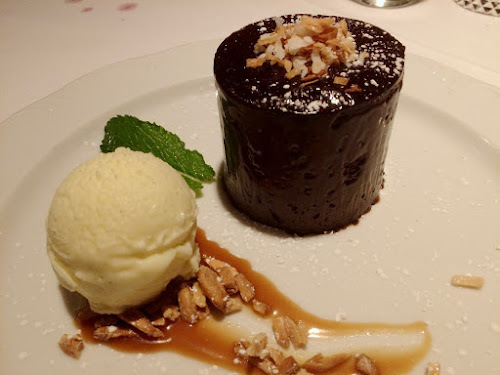 We were united in liking our dessert though, a cylinder of chocolate cake with a higher ratio of frosting-to-cake than a normal slice, served with caramel, almonds and vanilla gelato. It's a bit rich for a warmer weather dessert, but I couldn't pass it up. The Riggsby ice cream sundae with vanilla and chocolate gelato served with peanuts, Chantilly cream and a brandied cherry sounds really good too. Service at The Riggsby was generally good. The host stand got a little flustered when, in the middle of my telling them about our reservation, the previously seated party returned to ask for a different table. And our server didn't check on us after our entrees arrived, but otherwise our food arrived in reliably standard waves and the staff was friendly. I also liked the restaurant's appropriately retro decor. The bar area, which also functions as a secondary dining room, has dark green walls and artsy wallpaper, as well as a beautiful curved bar. This would be a great place to get a drink if you're in Dupont Circle and not up for a full dinner. The Riggsby is the second D.C. restaurant from chef and restauranteur Michael Schlow, following Tico, the wonderful Latin American-focused restaurant we visited last year. A third, the Italian Alta Strada opened recently, and I've really looking forward to trying its pizza and pasta-focused menu. Judging from his two places we've tried, Schlow is as adept at genre-hopping as some of D.C.'s other marquee chefs. And with the Riggsby, he manages the fun trick of looking backward while again contributing to the forward-march of great new restaurants in the city. It's perfect place to go if you want to feel like Don Draper, but arguably, you'll eat better too. The Riggsby, 1731 New Hampshire Avenue NW (between 17th, 18th, R and S Streets in the Carlyle Hotel), Washington, D.C. (Dupont Circle). (202) 787-1500. Reservations: Open Table.